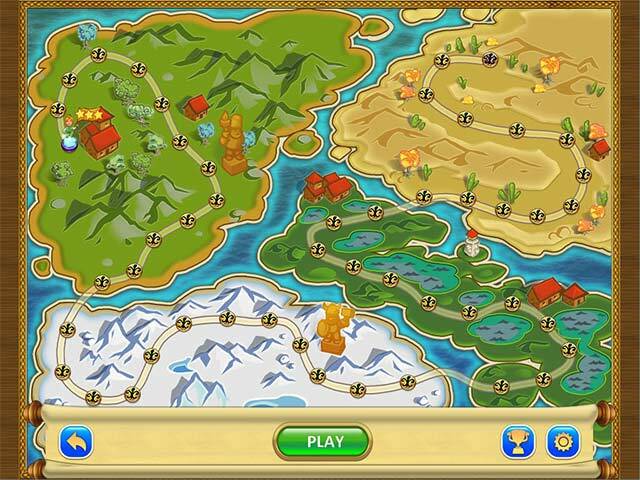 Head out with the gnomes on a journey through an unexplored continent in this exciting fantasy strategy game in Gnomes Garden 2! 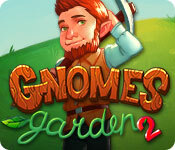 Gnomes Garden 2 is rated 3.7 out of 5 by 26. Rated 5 out of 5 by JeannieT_LFP from Better than the first Gnomes Garden I'm about a third of the way into the game, and I'm enjoying it even more as the levels progress. I'm not sure why so many reviewers felt the game was too easy; perhaps the gameplay is easier on pc's, but I find it somewhat challenging on my iMac. Many of the levels require my playing them a couple times, the first time to figure out the best strategy to get 3 stars, then again to nail it. As always, try before you buy; however, there are too few TM games being offered, and I'm please to recommend this one. Rated 5 out of 5 by pik62 from Fun game I bought Gnomes Garden 1 & 2. I hope there will be more of them. Addicting. Rated 5 out of 5 by McKoehn from Just fun. Thought this was one of the more fun time management games that I have played in a while. Thanks to the developers! There aren't enough TM games and I really do appreciate this one. Rated 5 out of 5 by HITman85 from The second time is good I liked the first part. The second turned out even better. Rated 5 out of 5 by MissyFritzi from Trolley level 38 I lovery this game but the Trolley moves so slow. I clocked it at 2:15 for one way. There is no way you could get three stars. Please fix speed. Rated 5 out of 5 by pennmom36 from Gnometastic! It's been a year since the Princess saved her country and her father from doom, and she began to get restless for another adventure. You should be careful what you wish for because low and behold, the evil Queen of Trolls appeared in the blink of an eye and cast a spell upon the Princess! The spell cast a thick, nearly impenetrable fog that surrounded the Princess until she couldn't even seen her own hand in front of her face! The Princess lost her way, until she wandered into an unfamiliar kingdom of gnomes. The entire kingdom welcomed the Princess, but they too have been terrorized by the evil Trolls, and asked for the Princess to help them fight the Trolls. Looks like her wishes for a new adventure are about to come true! This is a fairly easy Time Management game, it doesn't take a lot of strategy to complete the levels, unlike many TM games, you don't have to select tasks in a specific order to achieve a perfect score with three gold stars. 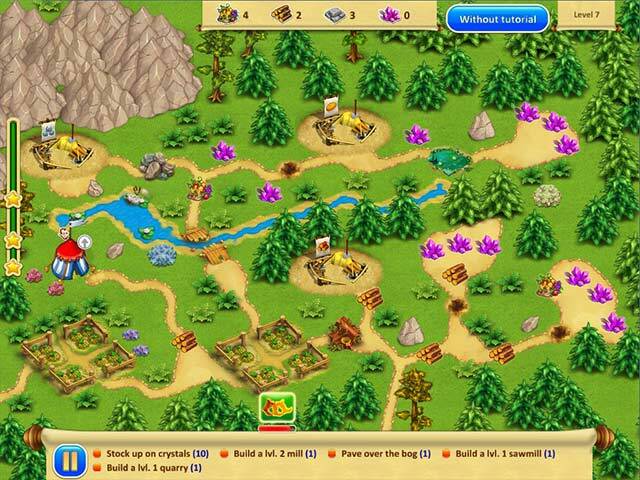 There are the usual tasks, collect food and other resources, clear blocked paths, repair holes, repair wood and stone bridges, build and upgrade Workers houses, Mills for food, Sawmills for wood, Quarries for stone, Mines for Crystals, and even a Fireman's house and a Sorcerers house. The Sorcerer needs a house built before she can cast spells, plant magic seeds, and restore the magic tree. Once her house has been built, she will need magic crystals to plant the seeds. Once she has planted the seeds, they will need to be watered, which requires a Fireman, the Fireman requires a house built, once the house has been built, the fireman needs a clear path to the water source, and so forth. The Fireman is also used to chase away the merryman who annoys the workers and prevents them from passing. 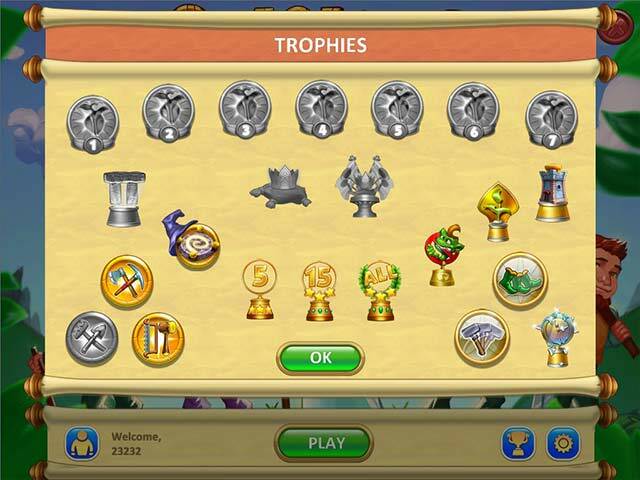 Each level gives you a new task to complete such as repairing Stonehenge, or repairing a Beehive so the bees will go home. As you progress, new bonuses are added to help you achieve your goals such as Swift feet which briefly give the workers supersonic speed, or Extra Resources, these bonuses will recharge automatically and you'll want to use them as often as possible because the levels are designed to include the use of them to achieve expert time status, enjoy! Rated 4 out of 5 by TooOld2Play from Enjoyable Game for a Rainy Day Yes, this game is a lot like many other build/collect/upgrade games in the family of Kingdom Tales, Viking Saga and the rest. But it is whimsy (the little annoying green bugeler and the fireman are adorable) and a wonderful game for those who enjoy kicking back with a time management game that doesn't make you feel like a failure for not getting 3 gold stars. The scenery graphics are simple and bubble-like in bright colors. This got a good rating from me but not an excellent for the mere fact it is similar to others. It was a daily deal and well worth the $2.99.